Yesterday, Marketing Pilgrim reported data from Altimeter Group that the average large company has 178 corporate-owned social media accounts. Who is setting up all of these accounts? How are there even Twitter handles left to go around anymore? Large companies with all the social media accounts, can you please explain yourselves? 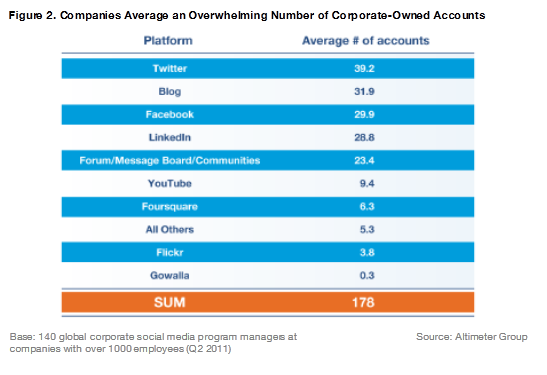 Altimeter gave us some more insight into these numbers, breaking down the average number of corporate-owned accounts by social network. And yes, the most accounts were on Twitter. Take a minute to soak in this seriously mind-boggling data before we break down what on earth is possibly happening here. So what's going on here? Do large corporations really have a need for that many social media accounts? Let's break down the reasons (some legitimate, some not) large companies are bombarding the social media world with their brands. 1.) People are claiming accounts in anticipation for future use. This makes sense if you're planning for things like product launches or expansion to other cities and countries. In fact, that's probably a common occurrence for larger companies, and is a social media best practice. 2.) Different product and service lines may call for their own dedicated accounts. This is especially important if there is not a lot of customer overlap between products and services within the organization, or if they are all drastically different from one another. 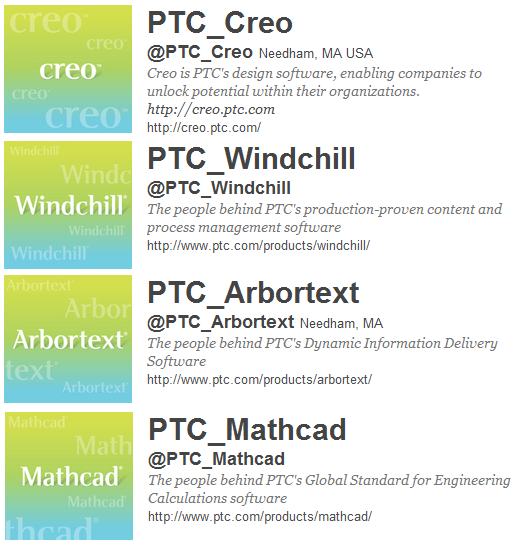 For example, product development company PTC maintains separate Twitter accounts for each of its four core products, along with separate accounts for product updates and news that is only relevant to a niche audience. 3.) Several departments within an organization may have created separate accounts, whether for internal departmental communications or for external communications. For some companies, large or small, this is wise, so the purpose of each account remains targeted and followers aren't inundated with information that doesn't impact them. While Verizon Wireless, for example, maintains a shocking number of social media accounts because its stores span so many different territories, it wisely maintains a separate support account on which the company troubleshoots service disruptions and other common issues. 1.) Like Marketing Pilgrim points out, maybe these businesses are creating accounts for specific campaigns. If you're like Geico and have such long-running campaigns as the Geico Gecko and the Geico Caveman (they've been going strong since 1999 and 2004, respectively), the separate social media accounts are certainly warranted. But one of the primary purposes of using social media for marketing campaigns is that your brand already has a following that can help give the campaign more leverage. Unless your campaign will last over the course of years like Geico's, why make more work for yourself by starting from scratch with a campaign-specific network? Or, if you're planning a campaign that lasts years and you find it falls flat, you should delete it, streamlining the amount of social clutter out there surrounding your brand. 2.) They may have started their accounts during the "you have to be on social media" upswing from the past couple of years, but rushed into it without much strategy. In fact, Marketing Pilgrim shares that only 43% said they had a social media strategy designed to meet their business objectives. Once they figured out what they actually wanted to do with the accounts, name changes were probably required, or they just had to wipe their slate clean and start with brand new accounts. That's understandable, but why don't you delete those accounts? At HubSpot, we decided to make this change ourselves just yesterday when we merged our @ContentCamp Twitter account with our main @HubSpot account. 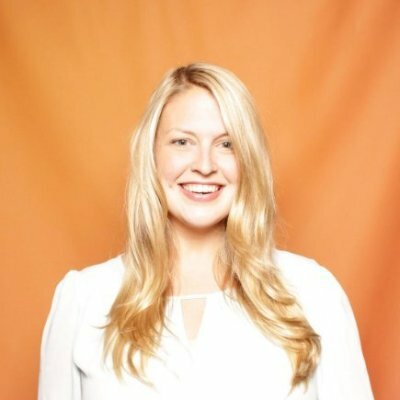 Now, Content Camp tweets will be tagged with #InboundLearning on the @HubSpot account so the tweets are still searchable but only one account needs to be followed, which thankfully makes the Twitterverse just a little less cluttered. 3.) It's possible large companies have such giant marketing departments that there's no intra-departmental communication. 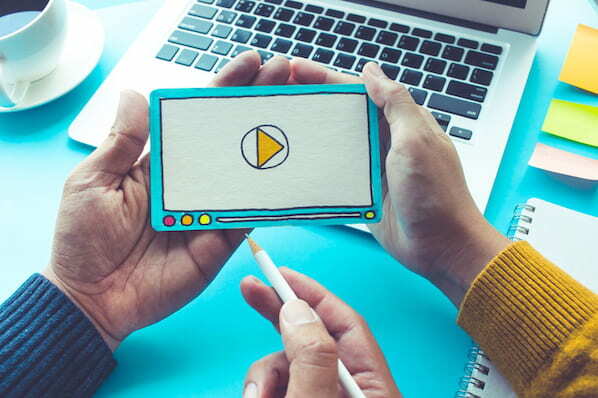 Can it be that multiple marketers are tweeting, Facebooking, Flickring, and YouTubing on behalf of the company, and on a branded company account? It's possible, sure. Smart? No, not at all. No matter the size of your company, make sure you have a handle on what your employees are doing on behalf of your brand on social media accounts. 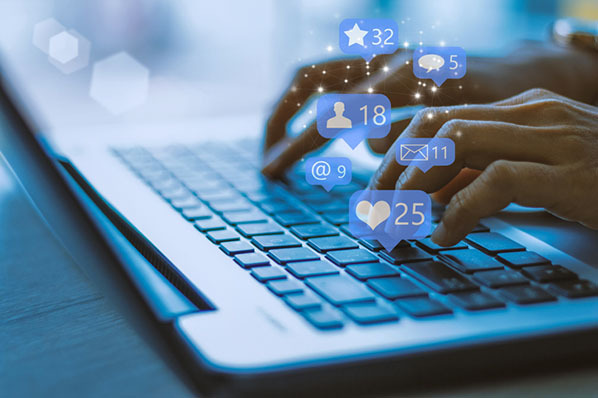 Take a look at these other companies' social media policies that help them rein in (for better or worse) their employees' social behavior when speaking for their brand in the social sphere. So, How Many Social Media Accounts Should My Business Have? Not as many as you need; as many as your followers need. And knowing how many separate accounts your followers need relies on pinning down not just a social media strategy, but also a very specific objective behind each account you set up. 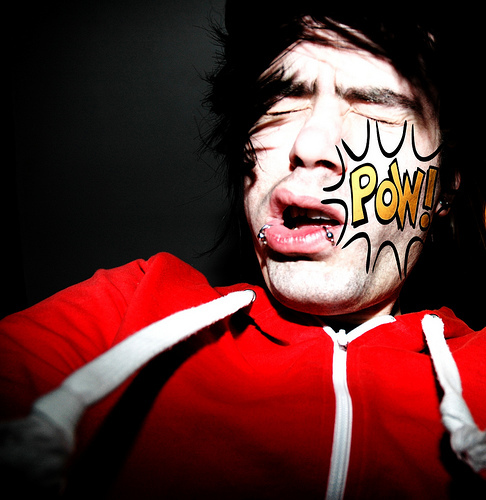 Why should people follow you and interact with you on a given account? Do you need a brand new account on the same social network to give followers and fans a reason to engage with you, or are the channels you have set up now sufficient to meet their needs? Are you leveraging all of the functionality the social networks allow to personalize a user's experience, like hashtags on Twitter, Circles on Google+, and tabs on Facebook? Are you prepared for the additional time and effort associated with maintaining multiple accounts? Make your actions purposeful, and understand how every account plays into the larger social media strategy you've defined. If you sit back and realize maybe you've gone a little social media-crazy, no worries, it happens to everyone. Just do yourselves, your fans, and the internet at large a favor, and delete those dead accounts! How many social media accounts does your organization manage? If you have multiple accounts, why do you choose to maintain them separately?